These are the results of the latest independent, clinical, double-blind study conducted by Dr. Joseph Greenberg, a Board Certified Dermatologist and Clinical Professor of Dermatology at U.C.S.F. This study was presented at the Annual Conference of the American Academy of Dermatology (Feb. 1995), and Published in the prestigious Journal of Dermatological Treatment (Sept. 1996), and the Townsend Letter (Nov. 1996). The study shows that HairPrime® helped to promote thicker, healthier hair growth for 90% of the subjects in the active group. Accompanying photographs may be viewed here. Full text with tables and graphs will be faxed or mailed upon request. Twenty-four healthy male subjects with Stage III-IV androgenetic alopecia were enrolled in a randomized, double-blind, parallel vehicle-controlled study to confirm the effectiveness and safety of a topically applied, standardized 7.5% herbal preparation (HairPrime®) cream used once daily in the treatment of androgenetic alopecia--the most common cause of hair loss, affecting one third of both men and women. In preliminary studies HairPrime® produced encouraging results as a hair growth agent. In one pilot study, all 18 subjects showed increased hair counts, averaging 119%. The investigator observed a very high percentage (50-100%) of conversion from vellus to terminal hair, and hair remelanization (50-100%). HairPrime® cream has also been evaluated for the treatment of scalp seborrhea and psoriasis. The results of this study confirm the safety and effectiveness of the cream formulation and should be of interest to both general practitioners and dermatologists who treat patients with androgenetic alopecia. HairPrime® is a patented, standardized 7.5% herbal extract in a cream base vehicle. The extract is standardized by replicative methods, including standardization against specific compounds which appear naturally in the extract. A double-blind, placebo-controlled trial was conducted to compare the effect of HairPrime® on hair growth in males with androgenetic alopecia against its placebo vehicle. The subjects were given either HairPrime® or a placebo of vehicle only. Both the active and the placebo groups were each randomly assigned four subjects with excessive hair loss. Patients applied the cream to the scalp daily, at approximately 24 hour intervals, for 40 weeks and were seen in the clinic for efficacy and evaluation every 4 weeks throughout the study. Subjects had their hair collected six times at eight week intervals (eight weeks at baseline and an additional forty weeks of follow-up). Twenty-four healthy male subjects under the age of 55 were selected for the study. The average age of the participants in the active group was 45.6 years versus 40.3 years for the placebo group. All subjects had Stage III-IV androgenetic alopecia. Eight subjects had excessive hair loss. The initial evaluation included health history, physical exam and evaluation of the alopecia condition. Any subjects with underlying diseases or subjects using systemic drugs (e.g. steroids, anti-hypertensives, cytotoxic compounds, vasodilators, anti-convulsant drugs, beta blockers, spironolactone, cimetidine, cyclosporine, anti-depressants) were excluded from the study. Informed consent was obtained from all patients before study entry. Each subject was tattooed with a permanent ink on their vertex area, creating a one centimeter triangle. The hair in the triangle was collected and the subjects entered an 8 week baseline period evaluation before beginning treatment. During the study (including the baseline period of eight weeks) all the subjects washed their hair daily with HairPrime® Shampoo. This was done to avoid the variable that the use of different shampoos would introduce. 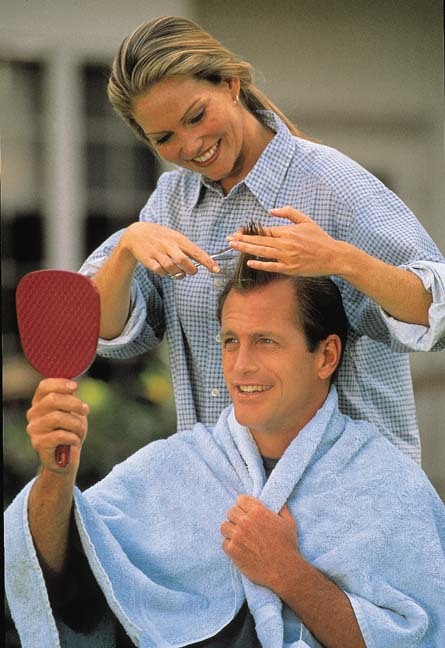 Two of the commonly used methods of evaluating hair growth are: (1) counting the hair on the scalp in a marked area and (2) various photographic techniques. Both methods can have a large margin of error due to the difficulty in counting hair on the scalp and the possibility of photographing a bent hair shaft and counting it as two hairs. To avoid these problems a more accurate method for evaluating hair growth, based on a protocol developed by Price, was employed. The evaluation included: total hair count and terminal (non-vellus, melanized, mature) hair count. Each subject was tattooed with permanent ink at three points on their vertex area creating a one centimeter triangle. After rinsing the hair at the permanent site with water and soap, the hair was washed with acetone to remove any debris that could change its weight. The hair from the triangle was collected using great care to harvest only within the marked area. The hair collected was placed on white paper, counted and then divided into terminal hair (non-vellus, melanized, mature hair) and vellus hair. The terminal (non-vellus, melanized, mature) hairs were then counted. Efficacy results demonstrate that HairPrime® cream, used once daily, is much more effective than the placebo cream vehicle in the treatment of androgenetic alopecia. Table I compares the average percentage change from baseline of the total hair count and terminal (non-vellus) hair count between the HairPrime® and the placebo-treated groups. After 40 weeks, 70% of the subjects in the active group had greater than a 30% increase in total hair count, compared with 16% of the subjects in the placebo group. The average total hair count for HairPrime® treated subjects increased by approximately 75%, compared to a 0% increase for the placebo treated subjects. 90% of the subjects in the active group had greater than a 30% increase in terminal (non-vellus, melanized, mature hair) hair counts, compared with 33% of the subjects in the placebo group. The average terminal hair (non-vellous, melanized, mature hair) count for HairPrime® treated subjects increased by approximately170% over the same period, as compared to an approximately 34% increase for the placebo treated group. No local irritation, sensitization or other averse effects were observed or reported in either the active or placebo groups. HairPrime® cream, a 7.5% standardized herbal extract preparation, is safe and effective in the treatment of androgenetic alopecia.